Contributors: Which architect, artist or designer is on your radar? Editor's Note: This issue celebrates innovation. Cultured 25: Here's what to do, where to be and what to see this spring. La Dolce Vita: Legendary dealer Barry Friedman closes his storied career with a Christie's sale of his own, wide-ranging personal collection. Powers Combined: The progressive-thinking Collective Design Fair grows into its second year. Master Class: Ralph Pucci brings his stable of design-world luminaries to Miami with a brand-new showroom in Wynwood. Art of the Crossover: Before there were collaborations like Pharrell and Takashi Murakami, Cary Leitzes had already mastered the creative connection. Breaking the Rules: Hannah Hoffman and Erin Falls are relishing the freedom of having a gallery in Los Angeles. Maternal Instinct: Faye Toogood returns to Milan with a softer aesthetic. Head South: Dallas Contemporary's executive director, Peter Doroshenko, gives us the scoop on Dallas Arts Week. Counter Culture: Cesar Garcia and The Mistake Room challenge L.A.'s art identity. Earthly Delights: Victoire de Castellane presents her first exhibition in New York. Living Architecture: The newest project for MoMA/PS1's Young Architects Program installation combines high design, natural materials and sustainability. New York State of Mind: Dan Colen, one of the city's pioneering artist of the new century is the focus of a new solo show at the Brant Foundation. Queen of the Night: Artist Jennifer Rubell revives the debaucherous spirit of old New York nightlife. Common Threads: Henzel Studio Collaboration's debut line of contemporary art rugs worthy of wall space. Fashion Forward: Who says you can't discover new art and fashion at the same time? FolioCue has you covered. Smart Moves: After making their mark in Los Angeles, gallerists Tim Blum and Jeff Poe extend their reach to New York and Tokyo. Full Circle: In her new book, "Victoria Sambunaris: Taxonomy of a Landscape, " the celebrated photographer takes us on her journey. Two of a Kind: The duo behind the buzzed-about New York art gallery 47 Canal navigate the art world on their own terms. The New Vanguard: With a Kanye commission in their pocket, New York architects Family are on a star trajectory. 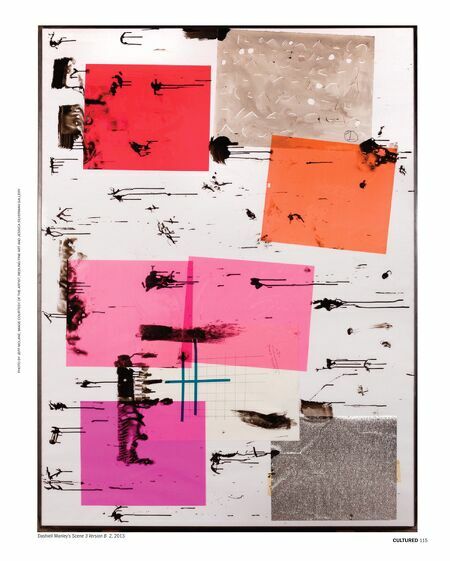 Global Exposure: RH Contemporary Art Scours the world to showcase an international array of work, including an eye-popping group show of current Chinese artists. 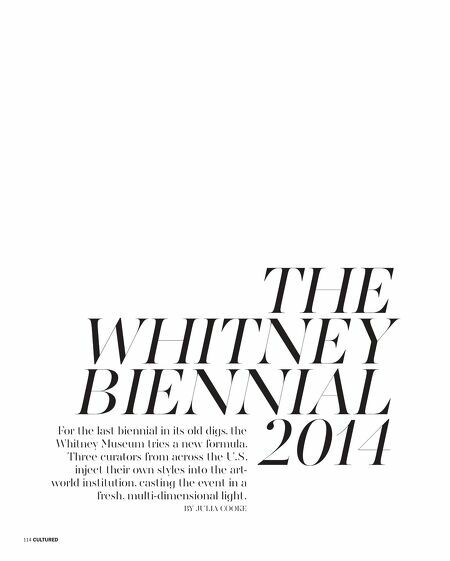 The Whitney Biennial 2014: For the last biennial in its old digs, the Whitney tries a new formula. Events: Harry Winston, The Surf Club and Perrier-Jouet honor Richard Meier. Cultured X AMMA: Fernando Mastrangelo and Samuel Amoia fuse the organix and synthetic for their new furniture line, AMMA Studio.